1 emptied or sealed bottle of water of any size up to one(1) gallon in size. NOTE: Please be aware - at the request of the Artist(s) or Band performing these rules can and have been modified in the past for select shows. Sometimes the artists do not allow cameras at all, and sometimes they do not allow water bottles for environmental reasons. It is not known until you arrive at the gate, so be prepared to check these items at the free bag / gear check booth or put them back in your car if necessary. For the safety and comfort of all of our guests as well as the artist performing: Please No sharp or dangerous items, (Free bag/beach gear check available at guest services) If you see something say something. ♫ Reserved Special Needs / Handicap seating is available for each performance base upon availability. Seats are sold on a first come first serve basis while they are available. Special Needs seating is available on all levels of the venue and can be purchased at all authorized points of sale. ♫ Children are allowed in the venue. All guests of any age are required to hold a valid ticket for that day’s event. We encourage guardians and guests to bring ear protection. We do not have control over the content of performances and may not be suitable for all ages. Others may also consider certain content objectionable. All patrons are required to wear shoes, shorts / pants & shirts for admission. The venue proudly sponsors a "Designate-A-Driver" program. Visit the MADD NY & designated driving booth, located on the red bricked plaza near the main entrance. Sign the designated driver pledge form and you will receive a complimentary small soda or bottle of water. You must be age 21 or over with valid ID to purchase alcohol. Please remember to bring proper Identification before entering the venue. Don't forget to visit our new TASTE NY Bar, located near Lobby "D" which will offer a rotation of New York produced wine, beer, spirits, cider and light snack food selections. The Taste NY Bar will be operational for most events this season. Legends is proud to offer well-rounded menu options that are thoughtfully developed by their leading Chefs with innovation and reflection of the preferences of today’s Guests everywhere – featuring local and regional favorites, global cuisine, vegetarian and vegan options, as well as selections to serve special dietary needs. Beverages include Pepsi fountain products, specialty waters, sports drinks, iced tea and Red Bull. 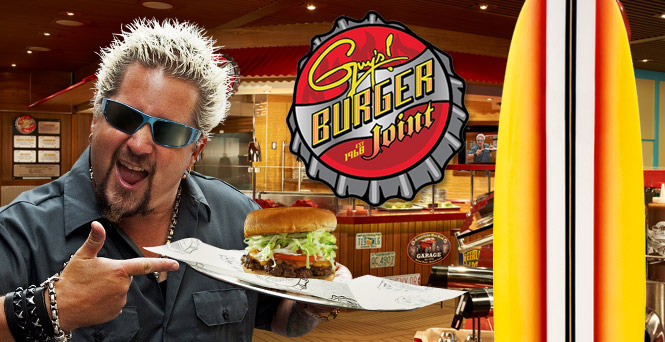 Guy Fieri brings you a tasty cast of characters: The Real Deal, Cheezy, Righteous Ring , Makin' Bacon Burgers or Seasoned Fries. Credit cards are widely accepted throughout the venue for food, beverages and merchandise. ATM's are located throughout the main plaza. Take an UBER to the show: Ride in style with Uber beginning June 29th. New user? Enter the code UBERNYS1 for $20 off your first ride. Fan Assistance: Emergency Medical Service is located on all levels of the venue. Our central medical location is on the main plaza near the large video signage tower. Service is provided by Northwell Health. Guest Services: Our Guest Service booth is located on the main plaza near the main entrance. For lost & found, visit Guest Services. Please come and have fun, be kind to your fellow guests, laugh, sing and most of all smile. WE ARE ALL FANS !!! ROCK RESPONSIBLY !!! The Northwell Health At Jones Beach Theater offers a wide variety of alcoholic beverages for purchase during your time at the venue. You are not permitted to bring any alcoholic beverages into the venue. A valid and current Driver License or State ID card is required to purchase alcohol- guests will be required to show ID every time they purchase. All Access passes or Backstage Passes are not available for purchase. Visit www.livenation.com to view any VIP packages that may involve a meet and greet or additional access. The venue box office does not sell any meet and greet, backstage or venue passes. Service animals are permitted inside the venue during events. Only registered working animals are permitted. We have multiple ATM's on site located throughout the main level of venue. ATM's can be located at stairwell #1, Concession Buildings B & C and inside the VIP club. If any assistance is needed with your vehicle please contact your normal Emergency Assistance provider. The Northwell Health at Jones Beach Theater does not have tow or lockout services on site. Emergency assistance vehicles are permitted on property to assist with lockouts, jumps or tows but the guest will need to arrange for such services. All bags are subject to search upon entry. Guest have the right to refuse a bag search and the venue has the right to refuse entry. If you have any items that are not allowed into the venue please return them to your vehicle. Signs larger than 8.5 X 11 in are not permitted into the venue. This size is a standard sheet of paper. We do not allow in banners or signs that are larger than this due to the potential to block other guests view of the performance. All signs must be appropriate in nature and not be a distraction to the artist. The box office is located by the Main entrance to the venue and will not be open for the season until April. All tickets have an $8 service fee. Busses will be directed to our main parking field #5 and may access the Bus/Limo/Taxi drop off location. Busses that will be dropping off guests can leave the parking lot and return 45 minutes prior to the end of the event with no additional charge. All busses will be boarded by our security staff to ensure no underage drinking is taking place on the bus. If there is any underage drinking- the whole bus will be turned around and no one will be able to enter the event. The venue will not issue refunds and bears no expense that will be incurred due to non-admittance. New York State Park Police will be on site assisting in the bus lot to ensure all guests on busses are acting appropriately and within accordance of the law. *Subject to change based on event. SUBJECT TO CHANGE- The standard venue policy allows camera phones, disposable cameras, and small digital cameras. Any camera that has a detachable lens will be considered professional and not allowed in. If the camera lens zooms out of the camera more than 1 in- it will be considered a professional camera and will not be allowed in. Some artists do not permit cameras so please check back for the show you will be attending to ensure that we will be allowing cameras in. The venue does not allow camping or overnight parking of any kind. Cancelations will only occur in the event of severe weather, artist cancelation, or an act of God. In the event of a cancelation local media will be notified and any information about a potential reschedule will be made available. Refunds will be available at the point of purchase. Generally cell phones are permitted in the venue. On occasions, comedy shows in particular, cell phones usage may not be allowed due to artist requests. All of our events are all ages. Children 2 and under do not require a ticket, but must sit on a parent's lap. The Northwell Health At Jones Beach Theater does not allow weapons on our property. Guests should follow all applicable laws regarding securing a weapon in a vehicle if they have it on them when they arrive. The venue will not secure weapons and will take no responsibility for any weapons left in vehicles. The Northwell Health at Jones Beach Theater offers a wide variety of concession options through the venue. This includes cheeseburgers, hot dogs, nachos, pretzels, candy, popcorn, fountain soda (Pepsi Products), water, and Red Bull. Concessions are located throughout the venue. All main concession stands take Visa/ MasterCard / Discover and American Express. Smaller stands and portable concessions may be cash only. See ATM's for locations on site. All merchandise stands take all major credit cards. Our concessionaire offers free fountain sodas to guests that commit to be the designated driver for their party. Please visit the designated driver booth which is located near the main entrance, inside the venue, near the MADD booth on the red bricked pathway. Guests are permitted to bring in One (1) factory sealed bottle of water up to one gallon in size. This policy is subject to change based on artist requests or safety considerations. Aluminum bottles, refillable plastic water bottles are permitted. Camelbacks are not permitted. Water fountains are located near or inside restrooms on all levels of the venue. Drop off areas are located in main parking field # 5 inside the Bus/Limo/taxi drop off location. This area is just east of the New York State Park Police sub station. Please let the parking staff know that you are dropping someone off and they will direct you. Guests cannot remain in their vehicles during the event- they must drop off and return 45 minutes prior to the end of the show. If you are not back within 45 minutes of the end of the event- you will not be allowed to enter until the majority of cars have exited the parking lot. Local law enforcement will shut down all incoming traffic and only allow traffic out of the venue. In the event of an emergency while on site- The Northwell Health At Jones Beach Theater has trained paramedics to assist with any medical issues. The venue's main first aid location is located on the main plaza near the Merchandise stand, but any staff member with a radio can dispatch First Aid to the location needed. Local law enforcement officers are also on site for every event and can assist if needed or requested. Venue management works closely with all appropriate emergency agencies and services to ensure that we are up to date on any dangerous weather or potential crowd related issues. In the event of a weather emergency- we will communicate with guests that are inside of the facility as well as guests on their way to the venue. There are a total of two(2) entrance gates to the facility. The main entrance gate is available for use regardless of the ticket type. For select shows there is one(1) Fast Lane gate located at the main entrance. You must have your Fast Lane pass to utilize this gate. The VIP Club / Premiere Parking has a separate entry gate located near the Box Office. All guests using this gate must be VIP clients and have the appropriate ticket. If you need assistance while at an event please visit our guest services area located near the main entrance, inside the venue, on the red bricked pathway. The Northwell Health At Jones Beach Theater will do our best to get any fan mail sent to the venue to the appropriate parties. We cannot guarantee that any package or letter will be given to an artist. We recommend visiting the artist’s website and sending any items to their designated address. We are not responsible for returning anything that is sent to the venue for an artist. For selected events guests can purchase Fast Lane passes via www.livenation.com for each event. The Fast Lane passes do not permit the guest to enter any earlier than the designated gate time, however it does have a shorter line. Fast Lane Gates are located at the venue's main entrance gate. Parking lots will generally open at 8:00am, prior to our scheduled gate time. Gate times vary, but are usually 8:00am prior to show time. Please check the specific event page as these dates are subject to change. Please do not attempt to enter the venue any earlier than the designated times as you will be turned around and told to return when the parking lots open. The Northwell Health At Jones Beach Theater does not offer group ticket sales. If you have a large party that will be attending the show the only option would be to contact our Premium Seating Department at (917) 421-5131â€‹.. Premium Seating sells all VIP boxes, suites, and clubs at the venue that can accommodate larger parties than the standard ticket limit. Guests are expected to behave respectfully and in accordance with venue policy, state and local laws. Any guest that is acting in a manner that venue management deems unsafe can be subject to eviction. If a guest violates a state or local law they will be subject to any tickets or punishment deemed necessary by local law enforcement. The Northwell Health At Jones Beach Theater strives to ensure that all of our guests have a great time at our venue. If you need additional assistance while you are here please make sure you let us know. Ticketing- ADA tickets can be purchased online via www.livenation.com. You do not need to call the box office to place an order as all of our accessible tickets are available through www.livenation.com. Look for the logo on the Find Tickets page to view all available accessible seats. We do have accessible seating in every price range, but be advised it does occasionally sell out. We have very limited seating available for guests on the day of the event so please make sure you purchase accessible seating when you order tickets. Day of Show Parking- Accessible Parking is located outside the Northwell Health At Jones Beach Theater in main parking field # 5. Let the parking staff know that you need accessible parking and they will direct you to this lot. You do not need to have an accessible placard in order to park in this lot, but please be advised that parking is limited. If you do not absolutely need accessible parking- please park in the general lots. Accessible Stations- if you have questions or need assistance we have a table staffed with customer service employees to help answer questions related to seating or other accommodations. These stations are located at the guest service booth, which is located near the main entry gate on the red bricked plaza. Unexpected Needs- if you have had an injury or illness that prevents you from using the original seat you purchased we strongly recommend going through www.livenation.com to exchange all tickets for accessible. We will have a very limited number of seats available on the day of the show for such issues, but we cannot guarantee we will be able to seat you. Please remember that accessible seating permits for the guest with the accessible need and one companion. Interpreter Requests- if you will need an interpreter for an event please give us at least 2 weeks notice to secure. Guests that request an interpreter will need to pick up their tickets at will call. When the tickets are picked up we will introduce you to your interpreter for the evening and take you to your seats. There is no charge for interpreter services. Please call 1-800-745-3000 to arrange for an interpreter for your visit. Accommodations- all venue bathrooms, concession stands, and merchandise stands are accessible. Guests that require assisted listening devices can contact our venue office prior to the event to arrange for a device. Please give us at least 2 days notice. Guests that require interpreter service can call the venue and arrange this for any event. We need at least 2 weeks notice to secure an interpreter. We can be reached at 516.442.8869. Please report any lost or stolen tickets to Ticketmaster as soon as you are aware they are missing or destroyed. If a ticket needs to be reprinted during the event- guests can visit the box office and have their ticket reprinted for a fee. From Westchester, Manhattan, Bronx, Brooklyn, Queens: LIE East or Grand Central Parkway East to Northern State Parkway East to Wantagh Parkway South to Jones Beach State Park or Belt/Southern State Parkway East to Wantagh Parkway South. Follow the signs to Bay Parkway East and the signs will direct you straight to the venue. Once you travel over the overpass, on Bay Parkway East, stay in your left hand lane. Follow the signs to the venue parking fields. From Eastern Long Island: Northern State Parkway West or Southern State Parkway West to Wantagh Parkway South. Follow the signs to Bay Parkway East and the signs will direct you straight to the venue. Once you travel over the overpass, on Bay Parkway East, stay in your left hand lane. Follow the signs to the venue parking fields. First Aid is located on all levels of the venue, with the main medical facility being located on the main level near the merchandise stands. We have trained medical personnel that are able to assist with any issue you encounter. We have ambulances on site throughout the duration of the event that can transport guests if needed. If you have medication that you need stored in a refrigerator please go to main medicla location, located near the merchandise stand and our medical staff will assist you. If you have a condition that requires you to use a needle for medication while you are here- please do so in our medical office so the syringe can be properly disposed of. Merchandise will be available for all concerts at our Concert Gear booths located building A which is located on the main plaza across form stairwells #1 & #2. For Festival shows- there will be merchandise located throughout the facility and sold by various vendors. All concert gear is property of the artist and the venue has no responsibility related to the craftsmanship or style of any merchandise. Please make sure you check that you have the correct size and there are no defects in the shirt before you walk away from the stand. The venue cannot assist with replacing or refunding any merchandise after the event has ended. Motorcycles can park in the VIP parking field, adjacent to the VIP entrance gate. There is no additional fee for motorcycle parking. There is no overnight parking permitted at the venue. Any unauthorized vehicles on site prior to an event or after an event will be towed at the owners expense. General parking is located in field # 5 and field # 4. The VIP parking field in #5A and may be accessed off of Bay Parkway traveling East. The parking fields are accessible via Bay Parkway and or Ocean Parkways. Local law enforcement are on site for every event and are responsible for directing all traffic into the venue. On Duty law enforcement officers are the only individuals able to carry a weapon on our property. We do not allow conceal and carry weapons to be brought onto our property nor we will secure them. If you are interested in purchasing a floor box, season seats or club access for the season please contact our PSS department at 917.421.5131. Neither the venue receptionists nor the box office can answer questions regarding pricing or availability for these boxes. Premier Parking is available for very event. The price will vary based on event. This can be purchased prior to the show via www.livenation.com or on site at the venue. Premier Parking is located inside parking field #5A. Premier Parking does not guarantee early exit out of the parking lot. There a some NICE bus routes which travel to the Jones Beach State Park and the venue on event days. Please visit the following website, http://www.nicebus.com/ for updated information. The Northwell Health At Jones Beach Theater participates in a venue wide recycling program. You will find recycling bins located though-out the venue. Please recycle where possible. Restrooms are located all levels throughout the venue. The main plaza, Stadium and Mezzanine levels all have restrooms and accessible facilities. Scalping or reselling tickets is strictly prohibited on the property of the venue. Any guest caught selling tickets on property will be turned over to local law enforcement. Re-Entry is not permitted at The Northwell Health At Jones Beach Theater. Please ensure that everything you will need for the event is brought in with you. If you do leave at any point in the evening- you will not be allowed back in without a new ticket. Venue security and law enforcement are located throughout the facility to ensure a safe and secure environment. All security personnel are wearing white shirts and can assist with any questions or concerns. Please do not hesitate to contact our on-site staff if any assistance is needed. Your safety and security are most important to us. Nassau County and NY State Parks have designated the venue as Non smoking. All sponsorship inquiries should be directed to our office- please call 516.442.8879 and ask to speak with someone in sponsorship. Any handouts or presence on site needs to be cleared with venue sponsorship. If you do not have permission to be on site you will be escorted off property. Are not permitted because there is nowhere for them to be stored. most of the time it is tolerated but you can be ticketed and/or arrrested by NY State Park Police. Some shows do allow audio recording so please contact us prior to the event you are attending to confirm if this will be allowed. Traffic is controlled by local law enforcement and the venue. If there are any major traffic issues that will impact the start of the event we will post this information on our social media pages. Small umbrellas are permitted in the venue This policy is subject to change. Upgrades are available through our Experience App- visit www.lnexperience.com to download the program and see all of the upgrades and experiences we have available. The VIP lots are located within parking field 5A. Guests must have a pass or be on the parking list to access these lots. Guests can enter this parking field via traveling east on Bay Parkway. All shows will go on rain, storm or shine. However, in the event of super severe weather we will keep our fans notified via our social media pages. Although very rare, an event may be delayed, postponed, or canceled depending on the severity of the weather expected. Will call tickets are available for pickup at the box office located (Insert Location Information). Please make sure that you have a photo ID matching the purchasers name to pick up tickets. Any name changes need to go through Ticketmaster Customer Service- 800-653-8000. Guests are not permitted to put tickets in will call for other guests to pick up. You will need to arrange to meet your party at the facility to deliver tickets. If tickets or passes are being left for you- they will only be left at the box office. This includes meet and greet passes, backstage passes, press passes, and tickets from the tour or other promotional company. We do not get these tickets until the day of the event close to doors so please do not try to pick them up earlier. If your tickets/passes are not in will call you will need to contact the person that left them for you to determine where they are. The box office cannot contact any member of the tour for you. ♫ The Bay Stage events will be located inside the licensed property and located a short distance from the VIP area. These events will not be able to be viewed/heard from the VIP area. ♫ Unfortunately, for the Bay Stage, there will be no grassy areas where blankets can be used. No lawn chairs will be allowed into the venue. These events will be General Admission and Standing room only.